Grief is an unavoidable part of the human experience. It is a normal, healthy reaction to the loss of a loved one, and it is also excruciatingly painful. In fact, the loss of a loved one is one of the most intensely traumatic experiences anyone can suffer, with the feeling that nothing short of bringing the person back alleviating it. Normal grief is painful enough; some people, however, “get stuck” in their grieving and the emotional pain never seems to subside with the passage of time. Much like an earthquake, grief shakes the foundations of a person’s life, triggering a full-blown separation response in adults. 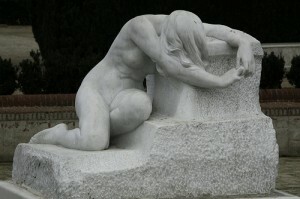 Acute grief is a cocktail of trauma and separation response; it is present most of the day, every single day, for approximately six months although it can last longer. There is often a sense of anger or protest at having to accept the loved one’s death, and an intense yearning to be with the deceased. Episodes of crying, sobbing, and feelings of sadness and remorse are typical, and should be thought of as a healthy grieving. Most experience a constant stream of images of the deceased which are incredibly vivid, and for some there are hallucinatory experiences in which the bereaved hears or sees the loved one for a few moments. There can be a very strong desire to relive and reminisce about their life with the loved one, spending long periods of time with important objects and photos at the expense of engagement in current life activities. Other symptoms can include a loss of appetite, feelings of emptiness, fatigue, poor concentration, feeling disconnected from the world, and restlessness. Normal grief changes over time, evolving as the individual processes the death. The grieving person is able, over time, to accept the finality of the death, and begins to understand that their relationship to the deceased is forever altered. The bereaved starts to be able to take pleasure in life, even if it forever different. There is a renewed interest in other people, with a capacity for joy even while the mourning process takes place. This is not to say that feelings of sadness and loneliness do not persist. These feelings, as time goes on, tend to shift to the background, and memories of the deceased person are bittersweet but not overwhelming. Surges of grief often occur on anniversary dates that bring up memories of the deceased. For about 10 percent of the population, the normal progression of grief can become derailed with prolonged and intense symptoms of grief. Complicated grief differs from normal grief due to complicating thoughts, feelings, and behaviors that derail the normal and healthy progress of adjustment. Some of these feelings include avoiding activities or places that illicit intense emotions related to the loss. Other symptoms include an intense preoccupation with the deceased, anger and bitterness toward the world in general, emotional isolation from others, rumination about how the person died, and how the death could have been prevented. The person may also feel that they have no idea how to manage how they feel; they may be emotionally out of control or perhaps overly controlled. working through of the grief, and cannot adjust to the finality of the death. There can be a sense of morbid hopelessness that they will never feel better. It is important to take pause and note that any bereaved person may experience the above symptoms going through a normal grieving process. If, however, these symptoms show no improvement over time, the grief may be more complicated than normal. Why Do Some People Develop Complicated Grief? There are several risk factors for complicated grief. First, the risk of developing the syndrome sometimes depends on circumstances of the loved one’s death. PTSD is more likely to follow after a traumatic death, such as a car accident, especially if the person regards his or her grief reactions with shame or as a sign of weakness. Individuals who have lost a loved one to suicide appear to be at a much higher risk for complicated grief. There are almost always persistent themes of guilt, blame, and shame emotionally as well as the task of trying to make meaning out of such a tragic and unnecessary death. Complicated grief also develops if someone has difficulty dealing with loss. Those that have suffered from emotional loss, trauma or neglect in early life are more likely to experience grief as persistently traumatic. Those with accumulated trauma over their lifespan are also at a higher risk, as well as those with a history of depression, anxiety or personality disorders. Complicated grief is more likely to occur if the person had an ambivalent or conflicted relationship with the deceased. Most of us tend to remember the good in those that pass away, but if an individual is racked with guilt due to negative feelings or interactions that they had with the deceased, the grieving process can take on a morbid, obsessive form. Treatment of complicated grief, through bereavement counseling or psychotherapy, allows the person in mourning to work through feelings of being “stuck” or preoccupied with the loss. Often, issues regarding emotional instability, previous losses, or difficulties in the relationship with the person who has died must be addressed for an individual to work through the grieving process. The mourning person is often concerned that they are upsetting others by talking about the deceased and feels uncomfortable acknowledging how much of their time and energy is spent in painful preoccupation. A patient, understanding clinician may be exactly what this person needs. Jennifer De Francisco, MPA, MSW, LCSW is a couples counselor in the Irvine, Newport Beach, and Orange County area. She specializes in relationships and depression. One Response to What is Complicated Grief?